San Diego Bonsai Club's chartered bus trip to the Bristlecone Pine Forest is on Saturday July 14th, 2018 for two days trip, leaving San Diego at 8:00AM Saturday July 14th and coming back on Sunday 15th 8:00PM. The cost for this trip is $238 per person for double occupancy room, and $320 per person for single occupancy room. That includes the bus and the hotel. The Ancient Bristlecone Pine Forest is a protected area high in the White Mountains in Inyo County in eastern California. 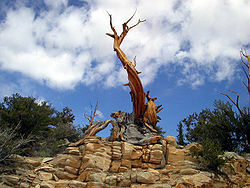 The Great Basin bristlecone pine (Pinus longaeva) trees grow between 9,800 and 11,000 feet (3,000–3,400 m) above sea level, in xeric alpine conditions, protected within the Inyo National Forest. The Methuselah Grove in the Ancient Bristlecone Pine Forest is the location of the "Methuselah", a Great Basin bristlecone pine that is 4,849 years old. For many years, it was the world's oldest known living non-clonal organism, until superseded by the discovery in 2013 of another bristlecone pine in the same area with an age of 5,067 years (germination in 3051 BC). "Methuselah" is not marked in the forest, to ensure added protection from vandals. ​There will be no cancellations or refunds after June 1, 2018. Payment must be received by May 1, 2018. Send completed forms to (or for more information contact) Abe Far Abe_Far@yahoo.com or call 619-384-0004. You may pay for the trip and download your form below.